Seal-coated premium northern ash handle for strength and durability. Extended blade socket for stronger connection between handle and blade. Tool Type: Shovel; Application: Farming; Gardening; Landscaping; Applicable Material: Clay; Gravel; Sod; Soil; Style: Square-Point Scoop. 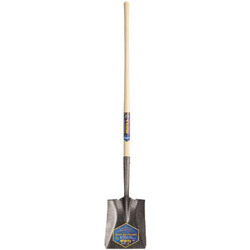 Shovels, Spades and Parts from Jackson Professional Tools! 576 In Stock today.